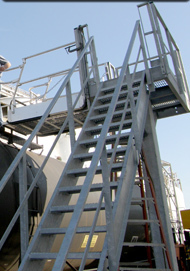 Modular Access Systems, LLC supplies loading racks and platforms with modular decks and heights. 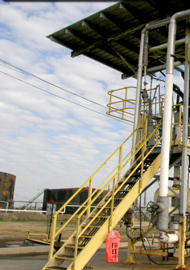 Our loading racks and loading platforms are available in single or double-sided access configurations and have optional full or half canopies. They can be configured with either parallel or perpendicular access. We have a complete line of gangways, access ramps, stairs and safety enclosures which, when added to one of our loading racks, will complete your loading and unloading solution. 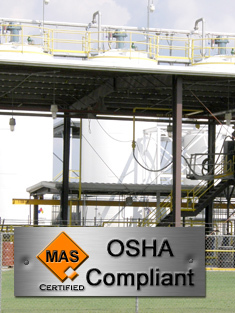 Our bulk loading modular safety access equipment gives you the peace-of-mind that you are following the OSHA guidelines for fall protection. Our pre-manufactured modular loading and unloading racks are designed to integrate seamlessly into your project and are ready to ship. That is how we help you deliver your project on-time and under budget. 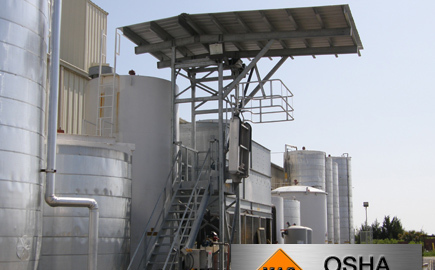 This platform was designed for a company loading Ethanol. The company had a limited amount of space and needed to load ten railcars at one time. We were able to load five railcars on either side of the platform and create a modular pipe rack to span the inside rail spur. 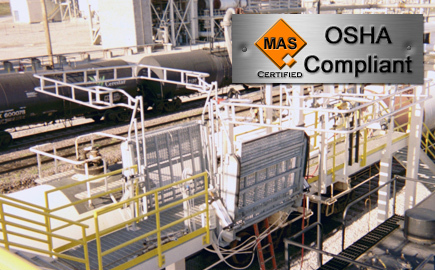 The platform is equipped with tracking gangways in order address any mis-spotting issues. The platform also was fitted with Emco Wheaton loading arms that have the capability of loading both sides of the platform, thus reducing the number of loading arms required and saving our customer a great deal of money. We were also able to integrate loading arm supports into the platform supports which eliminated the need for separate supports and foundations for the loading arms. Overall, because of our innovative design features and modular construction, this project came in well under budget and on time. 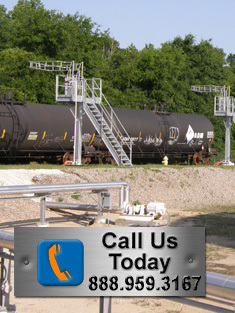 A major gas producer needed to expand an existing railcar loading yard with a 600' long, 20+ position railcar load rack including connecting pipe and a 180' walkway. Project criteria included: x-ray quality welding, fast delivery, minimum disruption of loading operations, safety and environmental compliance and competitive cost. We designed the foundations, loading rack and walkway with pre-installed pipe. 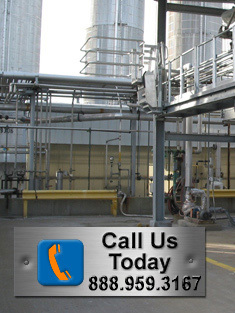 We fabricated the pipe, walkways, supports, ladders, stairs, safety bridge gangways and handrails in our shop. Our installation crew required only 4 men working three weeks to finish the project. All project goals were met. This is a tracking gangway loading rack for trucks we supplied for a client in California. 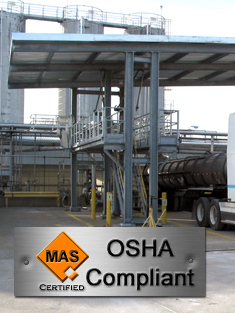 The trucks were unloading process chemicals and had several hatches the operators needed to access. 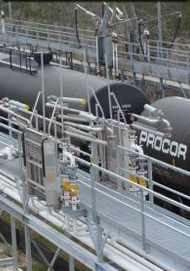 Prior to this loading rack being installed, the operator would access one hatch at a time and move the truck between each unloading operation at each hatch. 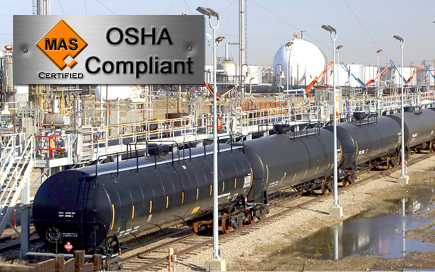 Our solution greatly streamlines the operation and makes the process much safer since spotting errors are effectively cut to zero. The operator can park the truck in one unloading location and roll the gangway up or down the platform to access all of the hatches on the truck. This double-sided rail loading rack in Edmonton Canada has a 4 foot wide and 12 foot high platform of galvanized steel. The platform is equipped with flat ramp gangways with walking extensions. Since the client has a dedicated railcar fleet, the gangways and loading arms are staged on the platform so all of the railcars could be serviced without uncoupling. 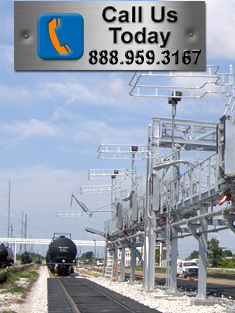 This saves the client a great deal of process time and expense by avoiding costly car staging fees from the railroad. These are our single pedestal rail loading racks. The platform is 4' x 6' and they stand 12 feet high. The platforms are galvanized steel and the gangways are marine grade aluminum. The safety cages are two rail and measure 7' x 8'. This is a standard piece of equipment for us and can be shipped out and on site faster than you can get your foundations installed. This loading rack uses eight foot wide pneumatically operated gangways with two-rail safety cages. 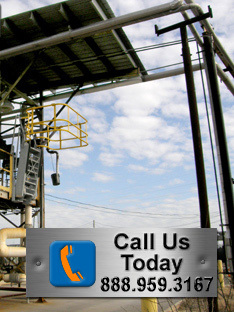 The client in Beaumont Texas needed to address spotting issues. The crash box is about eight feet long on most railcars. The manway on these crash boxes can be offset left, right or dead center. The railroad operator tries to align the manways and loading gangways when he is spotting the cars, but since a typical gangway may only be 24 inches wide, and the manways may not all center in the crash boxes, often the cars must be uncoupled and loaded one at a time. 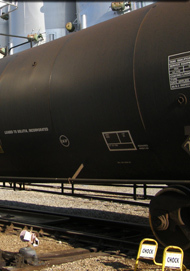 This solution allows the railroad operator to spot multiple cars at once. The gangway is as wide as the crash box, so it will address the manway no matter where it is placed on the crash box. This solution saved enough money in railroad fees in its first year to pay for the project. This is a double-sided truck loading rack with full canopy. The gangways are powder-coated self-leveling tread gangways. 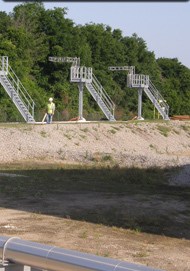 The self-leveling gangways allow the client to access multiple types of trucks with varying height tanks. The gangway can travel up or down to a 45 degree angle and maintain a level tread for safe access. The gangways are powder-coated aluminum, which allows them to remain light and still resistant to the caustic substances being loaded. Our company built this platform over 14 years ago. The gangways were recently replaced. These two gangways were retrofitted and installed in less than three hours. This is a four bay tank truck loading rack with full canopy. The platforms are fitted with tracking gangways to ease tight access problems with multiple hatch trucks. Once the truck has been spotted, it can remain stationary until all loading operations are completed. 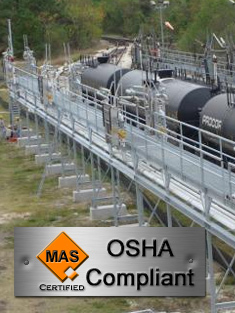 The gangway tracks along the face of the platform to align with any hatch on the tank truck. This is available in aluminum, galvanized steel, painted steel or powder-coated aluminum. 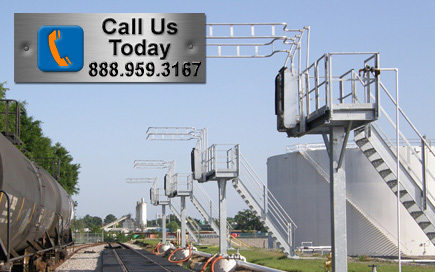 This single pedestal rail loading rack is used by a client here in South Carolina to unload solvents. They needed access to the top of their railcars to vent them. In this picture, the client is on top of the rail car inside the crash box. Most crash boxes are 36 inches tall and 8 feet wide and 8 feet long. 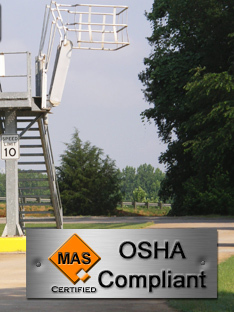 Once an operator is six feet off of the ground, OSHA considers it to be an elevated work surface and requires a 42 inch handrail like a platform or catwalk. This unloading operation meets OSHA fall protection requirements since our safety cage rests over the top of the crash box. This is a single-sided tank truck access platform with half-canopy in Sedona, California. The client needed an all-weather, cost effective way to load bio-diesel and keep rain out of their product and off of their operators. The platform is six feet wide, 8 feet long and 10'-6" high. 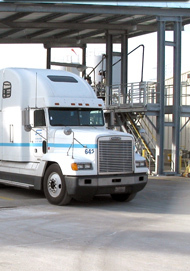 The canopy was designed to cover the entire platform as well as the loading area of the tank truck. The gangway and safety cage are made of marine grade aluminum. This is a standard piece of equipment and can be on site in less than three weeks and erected in as little as two days. 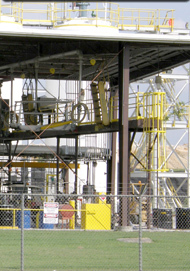 This is a bottom unloading facility in Charleston, SC. 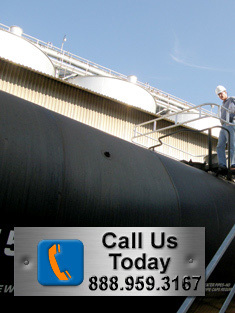 The client needed safe access to the top of the railcars in order to vent the hatch while bottom unloading oil. The platforms are 4 x 8 wide and 12 feet high and are equipped with tracking gangways to make spotting less critical. 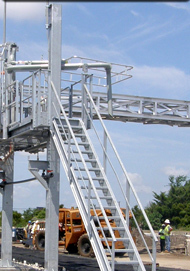 This gangway tracks eight feet along the face of the loading rack platform in order to allow the client to align it with the man-way of the railcar. 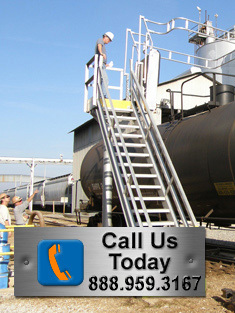 This creates a safe and efficient access path to the crash box and hatch without having to incur costly repositioning charges from the railroad or risk additional fall hazards from poorly aligned access due to spotting error. This is a standard piece of equipment for us and was shipped within 24 hours of their order and installed on site in less than 6 hours. This single pedestal rail loading rack has a platform 4' x6' wide and is 12' high. It is supported by a 12 inch square tube and is shown with a galvanized finish. All dimensions are easily customizable and it is available in prime steel as well as your individual paint specification or powder coating. The gangway shown is a 36 inch wide flat ramp model with a 24 inch extendable walking surface. This gangway is available in galvanized steel, aluminum, and painted or powder coated aluminum finishes. The two-rail gangway safety cage is 7'x7' and is 12 inches deep. 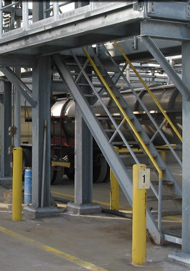 This four bay parallel access loading platform for trucks in St. Matthews, South Carolina has a full canopy and vapor recovery system. 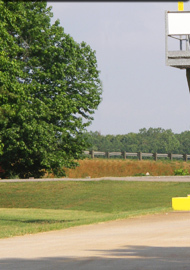 When a truck pulls into a predetermined spot, the driver lowers the safety stair gangway over the hatch of the truck for ergonomic, safe access. Fall Protection is further enhanced by using overhead anchor points. This solution is best used when truck orientation does not allow perpendicular access loading.